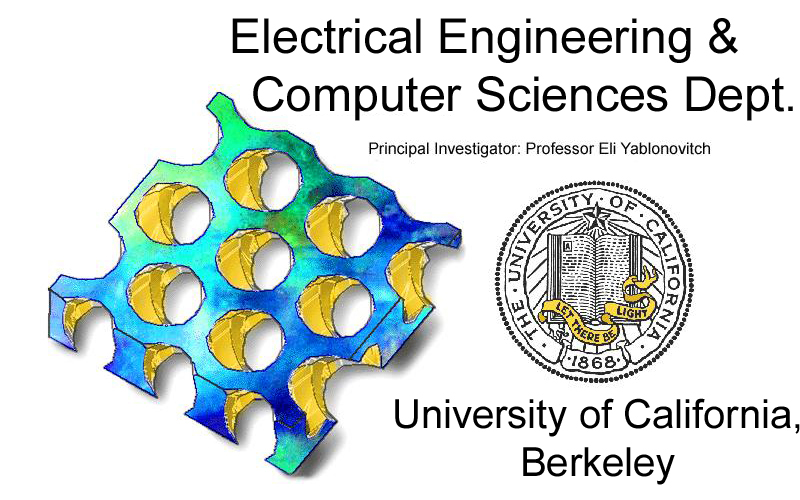 Located in the UC Berkeley college of Engineering, the group is headed by Prof. Eli Yablonovitch, CV, a pioneer in the field of optoelectronics and photonic band-gap research. Our laboratory is comprised of many talented and dedicated graduate and post-doctoral researchers. Our work is focused on the exciting, innovative fields of optoelectronics, high speed optical communications, high efficiency light-emitting diodes and nano-cavity lasers, and photonic crystals at optical and microwave frequencies. Streaming video of "The Physics Behind the New Solar Cell Efficiency Record"
Streaming video of Prof. Yablonovitch's Lecture from the Solar Energy Mini-Series at Stanford University. "The Opto-Electronics of Solar Cells"
"Pronounced Effect of pn-Junction Dimensionality on Tunnel Switch Sharpness"
"Strong Internal and External Luminescence as Solar Cells Approach the Shockley–Queisser Limit"
"Photonic Crystal Origin of Parrot Feather Coloration"
"Nature Materials interview with Prof. Yablonovitch"
Prof. Yablonovitch talks about his pioneering contributions to the field and his vision for nanophotonics. "Photonic Crystals: In Science, Technology, Medicine and Nature"
A pictorial journey of where photonic crystals can be found in our world today. Streaming videos of invited talks from the 2012 Symposium on the Diversity of Opto-Electronics at UC Berkeley. "Photonic Crystals: What's in a Name?" Prof. Yablonovitch's Light Touch Column from the March 2007 Issue of Optics & Photonics News. "Photonic Crystals: Semiconductors of Light"
Prof. Yablonovitch's article from the December 2001 Issue of Scientific American. Reproduced with permission. "Animation of 3D Photonic Crystal Structure"
"Review of Prof. Yablonovitch's Lecture on the Semiconductor Roadmap"